A common misconception about Universal Orlando Resort is that the attractions at Universal Studios Florida and Islands of Adventure are designed mainly with teens and adults in mind. Quite to the contrary, there are many rides, attractions, and activities for younger children (nine and under) to take part in and still have fun. The OI Universal Center is proud to present you with everything you need to know about what is available for the younger crowd for both theme parks. On this page, we will discuss Universal Studios. To learn about Islands of Adventure, click here. As you first enter the KidZone area, you will encounter Animal Actors on Location, a live show featuring Hollywood’s famous animal actors. Kids of all ages will enjoy this show. Express Passes are accepted here. Stroller parking is marked at the entrance to the show. You sit in a stadium-like covered area, and you may want to be toward the front so your child can have a good view. Also, volunteers are taken from the audience, and your child may have a better chance of being selected the closer they sit to the stage. Pigs, birds, chickens, roosters, dogs, cats, and even a skunk are some of the animals featured in the show. Watch one animal steal another’s reward while the trainer is not looking. Also, the pig has a good sense of humor. After the show, you can walk toward the stage for a short photo-taking opportunity of the trainers with some of the animals. Animal Actors on Location at Universal Studios Florida. The next attraction in the KidZone is A Day in the Park with Barney, which is a very entertaining sing-along show with Barney, Baby Bop, and BJ . Express Passes are accepted at this attraction. Stroller parking is marked in the plaza outside the attraction. Also, the queue for this attraction is shaded. There is a preview show outside the theater. Once you are in the theater, every bench seat has a good view of the show’s stage, which is in the center of the room (unless you sit behind someone very tall). As you enter the theater, if you sit on the left-hand side, you will be near the exit doors. Be careful not to sit in the front row if you think your kids may try to walk up to Barney during the show (that is not allowed). After the show is over, the audience is directed to exit through an indoor playground and souvenir shop, which can entertain kids for quite a while. 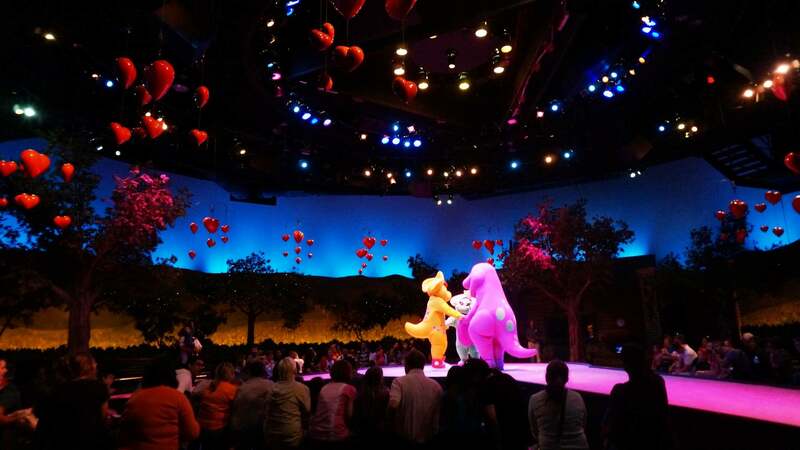 Your child can also meet Barney in the indoor playground area after the show, so get in line as soon as the stage performance is over. Barney’s indoor playground is also accessible through the gift shop and from the plaza area next to the entrance to the Barney show. Strollers are not permitted in the playground. This playground is designed for the toddler/preschool child with many hands-on experiences, including water- and sand play. Kids can pretend they are riding on BJ’s express train. There is a tree house where climbing skills come into play, along with a slide. There is also a play set for those 36 inches and smaller. Step on the colored stones on the floor, and you will hear different sounds. There are several benches for parents to sit and cool off while their kids play in each area. 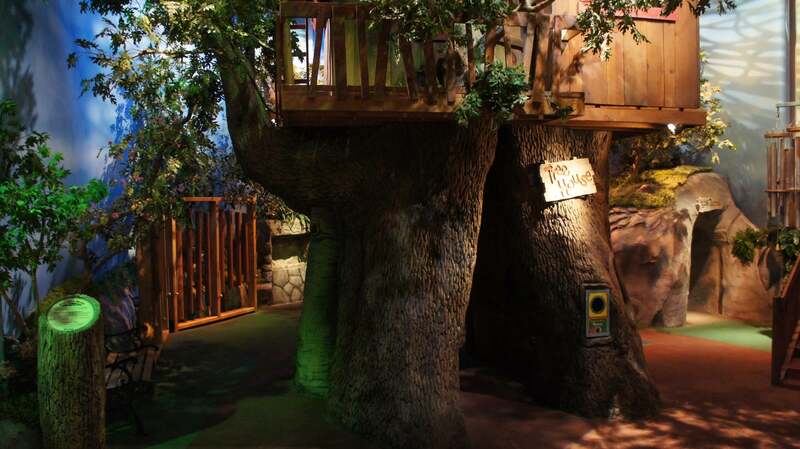 Barney’s Backyard indoor playground features this tree house and much more! The restrooms near the Barney show are designed for young people; they have shorter toilets and sinks. Keep this in mind if you are a tall adult. 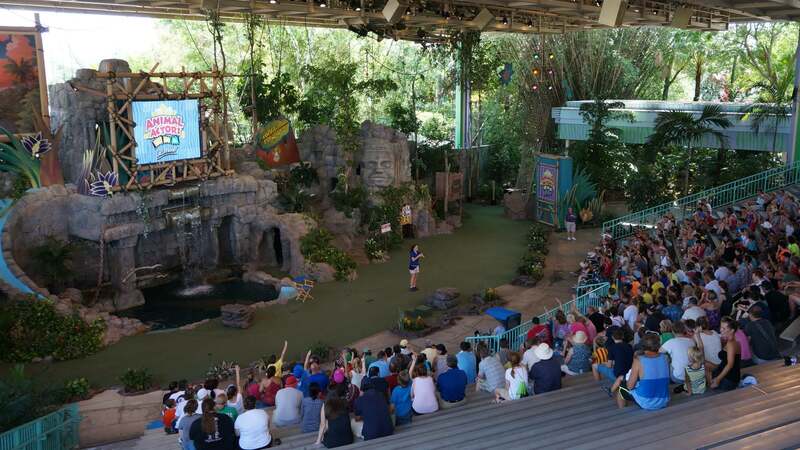 Another popular KidZone attraction is Curious George Goes to Town. This playground is designed for children and has water features that will help them cool off and use up some of that excess energy only kids have. You can park your stroller along the outside of the playground. As you enter the playground, follow the yellow monkey footprints and read the story. There are three sections to the playground. The first section is the water feature located in the center of the playground. You will get splashed by the fountains and other water structures. Watch the large bucket on top of the structure fill up with water; when you hear a bell clang, the bucket will turn over and flood the area with water. This is great fun for all ages. Inside the structure are many water features, including a curtain of water. 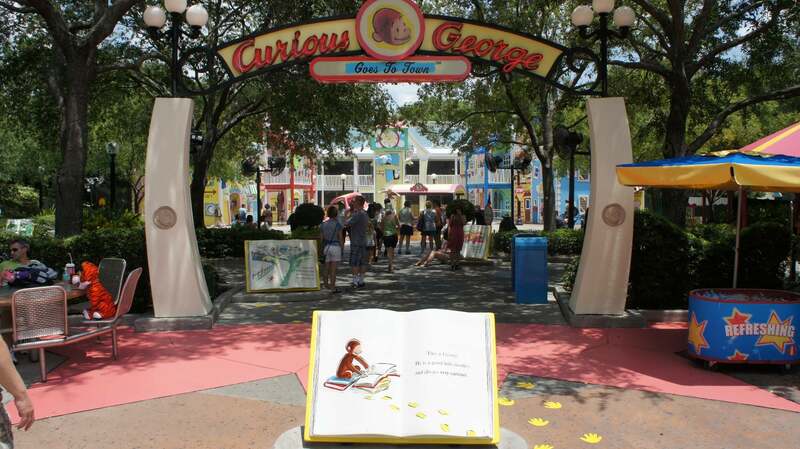 The second section of the Curious George playground is the enclosed Man in the Big Yellow Hat’s Ball Factory. You can access this area in the back of the playground by following the red footprints toward the left. This path will enable you to keep dry if needed. As you reach the Ball Factory area, you can either enter through the front or up the ramp to the second floor in the back. The Ball Factory has different “machines” that you can vacuum up the balls and then shoot towards others nearby or on a different level. The third section of Curious George’s playground is the animal show, designed more for the toddler or preschooler. This covered section is on the right side of the playground and includes a play structure that has a slide and various activities. Along the perimeter of the animal show is pictures of animals. When you press the button next to the picture, it will make the sound of that animal. For those kids who are at least 36 inches tall (the average 4-year-old), Woody Woodpecker’s Nuthouse Coaster is a great ride. Express Passes are accepted at this attraction. This kid coaster has just enough thrills for the younger crowd and is perfect for a first-time roller coaster rider. As you wait in line, notice the signs along the route. After you get up to the loading zone, you can choose which seat you want to ride in. The average adult and child can easily fit in the car together. A loud bell rings and a whistle blows right before the coaster starts. Other family members can watch the coaster riders from benches placed nearby, which create great photo opportunities. 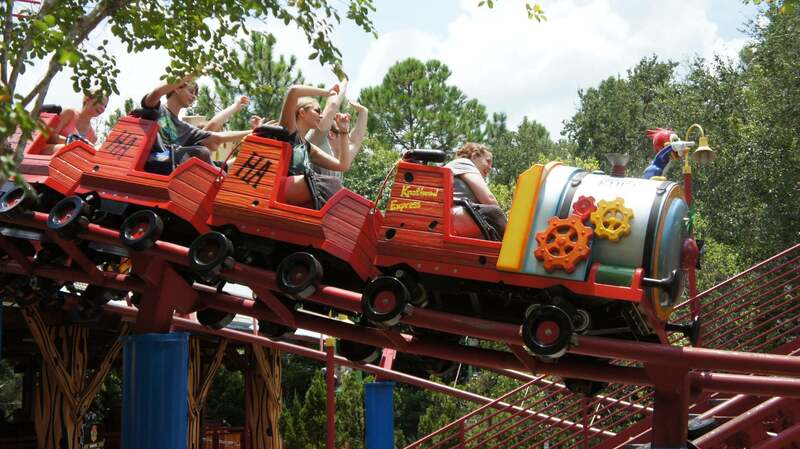 Another attraction in the KidZone for younger children is Fievel’s Playland. This playground is designed from a mouse’s perspective, with tunnels, slides, bouncing cages, and climbing areas. Stroller parking is marked near the attraction. There is only one way in and out of this attraction. A section to place your child’s shoes in is in the back, right-hand side of the playground. The floor of the playground is padded to minimize impact. There is a section at the beginning of the playland where your child can splash in the water. Several climbing and bouncing areas are limited to a maximum height for children not taller than the posted matchstick, which is a great play area for toddlers. The Moose climb is for the more adventurous young child. They can climb on nets up to the second level. Parents can access the second floor by steps and walk up at the same time as their child climbs the nets. Another fun aspect of Fievel’s Playground is the raft slide. The sign cautions that your bottom will get wet on this ride. Access to the raft slide is on the back, left-hand side of the playground. Climb up to the top of the playground, climb into the raft, and slide down through the tunnel to the bottom. An average adult and young child can fit in the raft together. The final attraction in Woody Woodpecker’s KidZone is E.T. Adventure. This ride has a minimum height requirement of 34 inches, which is the average 4-year-old. Stroller parking is next to the attraction. Express Passes are accepted. E.T. Adventure is a fun, indoor ride that makes you feel like you are riding a bike in the night sky, just like the characters in the movie. If you sit in one of the two left bikes in your row, you will have a grand view of the town as you fly over it. Notice that ET is no longer in the basket of your bike after you have arrived on his planet. Be sure to listen at the end of the ride when E.T. tells you goodbye and says your name! In addition to the rides and attractions in the KidZone, you can also meet-and-greet characters like SpongeBob and other Star Toons, like Curious George and the Man in the Yellow Hat. Consult your park map for scheduled meet-and-greet times. There are numerous kiosks that sell various souvenirs, snacks, and drinks all around the KidZone. Barney has his own shop, where there is a vast selection of Barney clothing and memorabilia. You can also purchase souvenirs at the store next to E.T. Need to rest your feet while you are in the KidZone? There are many sitting areas throughout this area with a significant amount covered or shaded by trees and buildings. Be sure to visit our Woody Woodpeckers KidZone title page for an interactive map. Kids of all ages enjoy parades and Universal’s Superstar Parade. The parade often begins at 2:00 pm or 5:00 pm daily, and lasts about 25 minutes (double-check your park map for the parade time). 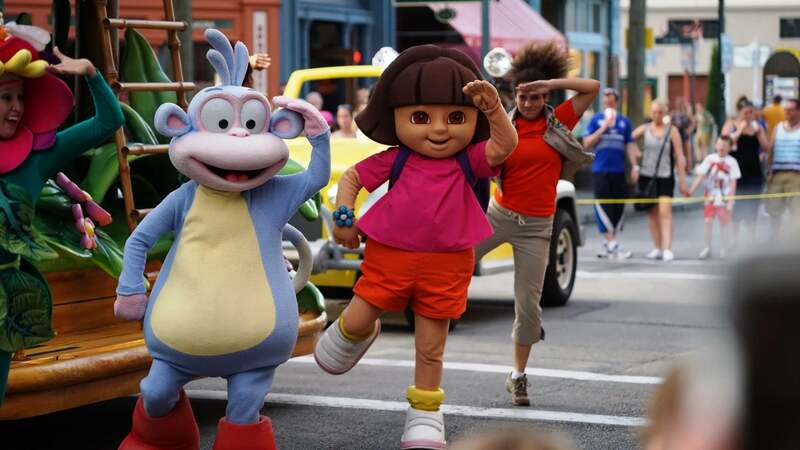 This is a fun entertainment experience featuring familiar characters young children love, including Dora and Diego, SpongeBob, the Minions from the Despicable Me movie and more. The parade stops and a street show is performed for the audience in New York (near Revenge of the Mummy and Finnegan’s) and again in Hollywood (near Schwab’s Pharmacy). Superstar Parade at Universal Studios Florida. 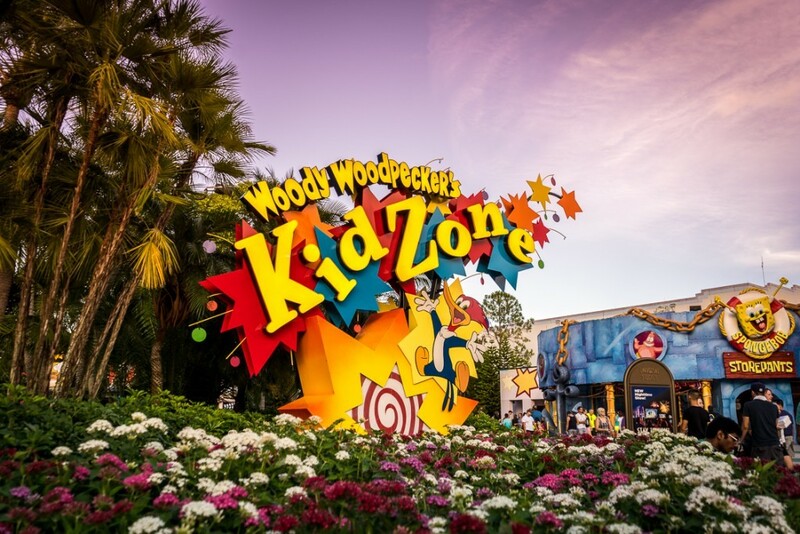 Outside Woody Woodpecker’s KidZone, the Superstar Parade, and Cinematic Spectacular, there are several attractions, rides, and shows without height requirements in Universal Studios Florida. You will need to use your judgment whether or not it is appropriate for your younger children. Shrek 4-D does not require a minimum height. Express Passes are accepted at this attraction. Unless you are sitting in the stationary seats at the front of the theater, your seat will mimic riding a horse and other rough actions as depicted on the screen and may be too scary or unsettling to some younger children. Otherwise, it is a fun adventure with Shrek, Princess Fiona, Donkey and other Shrek movie characters. Your child can Meet Shrek and Donkey and have their picture taken with Shrek, Donkey and sometimes Fiona. This photo will make a great souvenir of your vacation. Donkey interacts directly with you and strikes up a funny conversation with your group. 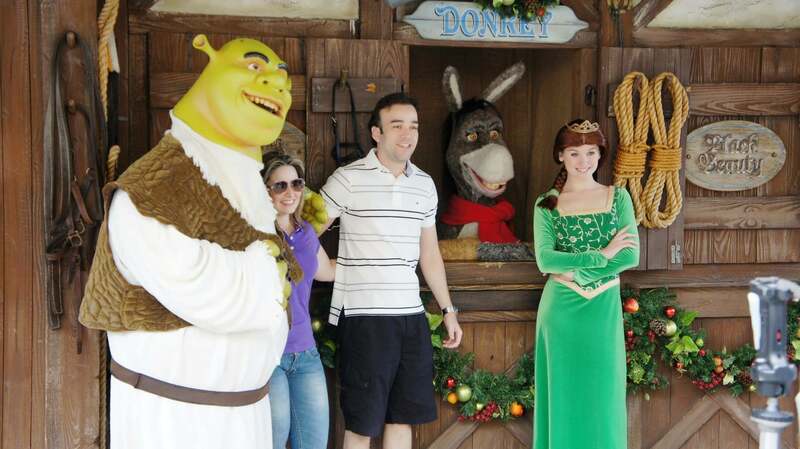 Meet the Shrek family at Universal Studios Florida. The Blues Brothers Show on Delancey Street is a live, entertaining street show featuring Jake and Elwood who arrive in their police car. This show is fun for the whole family, no matter what age. You can sit on the steps of the shops or on the sidewalk along this street, eat a snack and enjoy the great music. You can also join Jake and Elwood in the street as they dance during the final song of the show. Harry Potter and the Escape from Gringotts has a height requirement of 42 inches, meaning children ages 7 to 9 are typically tall enough to ride this attraction. Although not big on physical thrills, the “multisensory” nature of the ride can be either very stimulating or overwhelming, depending on the age and personality of your child. The Hogwarts Express has no height requirement and is a pleasant, leisurely train ride through downtown London and the Scottish countryside. Many characters and locations from the Harry Potter films and books make an appearance, although the very brief Dementor encounter could possibly be frightening to younger children. Once the ride is over, passengers disembark at the other Wizarding World of Harry Potter, in Islands of Adventure (making this the most entertaining way to park hop). 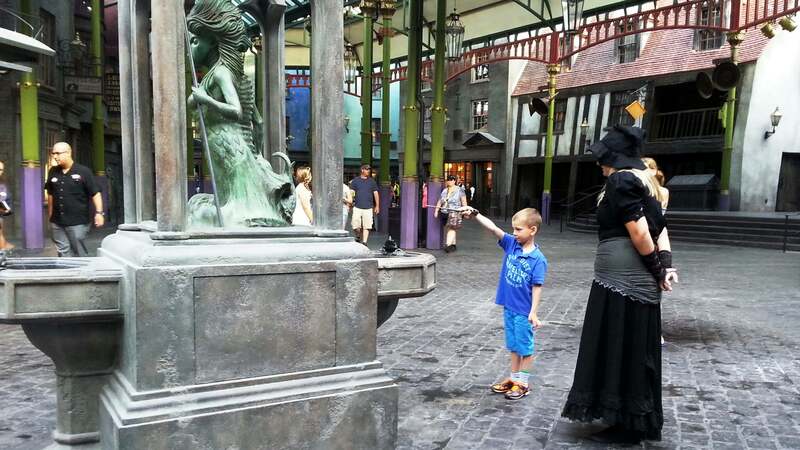 The interactive wand experiences located all throughout Diagon Alley allow children to stand at specially marked locations, flick their wands, and watch as magical effects transpire all around them. Please note that special interactive wands ($44.95) are required, and that some of the wand movements need to be rather exact – younger children may need assistance. Diagon Alley at Universal Studios Florida. Children of all ages should enjoy the Tales of Beedle the Bard and Celestina Warbeck shows, particularly the former, as it features highly detailed puppets (one 13 feet tall!). Consult Team Members on-site in Diagon Alley for times or check the Universal Orlando app. The Simpsons Ride has a height requirement of 40 inches. Children ages 6 to 9 usually are tall enough for this attraction. Express Pass is accepted at this attraction. Stroller parking is indicated outside the ride. If you are prone to motion sickness, this ride may not be for you. This ride is a fantastic, non-stop simulator featuring the characters from the Simpsons TV show. Riding in the front row is best for your child, especially if an adult could be sitting in front of them if you are in the back row. 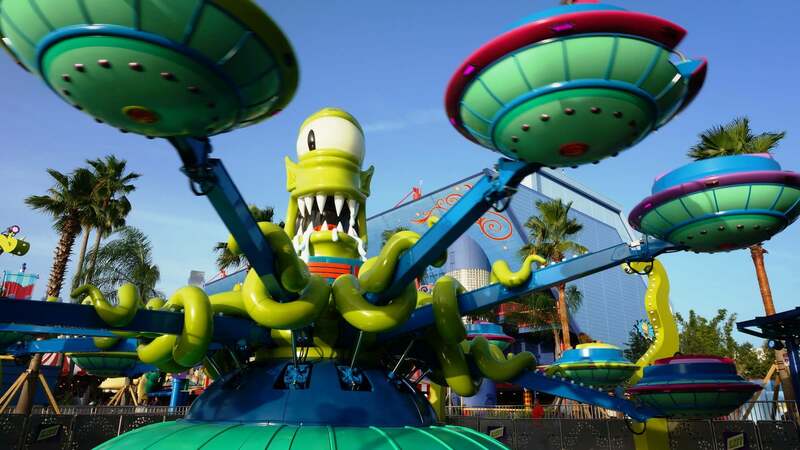 Kang & Kodos’ Twirl ‘n’ Hurl at Universal Studios Florida. Fear Factor Live does not require a minimum height. Express Pass are accepted at this attraction. However, this show may be boring to young children who may not really “get” the physical dares. Your child can meet various characters in the Hollywood Character Zone. Dora, Diego, and The Simpsons are just a few of the characters available for photos. Check out our Characters at Universal Orlando page for more information. The Horror Make-Up Show accepts Express Passes. Although there is no minimum height requirement, this show is probably not appropriate for young children. There is no height requirement for Terminator 2: 3D. Express Passes are accepted at this attraction. Stationary seating is available, however parental advisory is noted on the park map as this attraction may be too intense for young children. 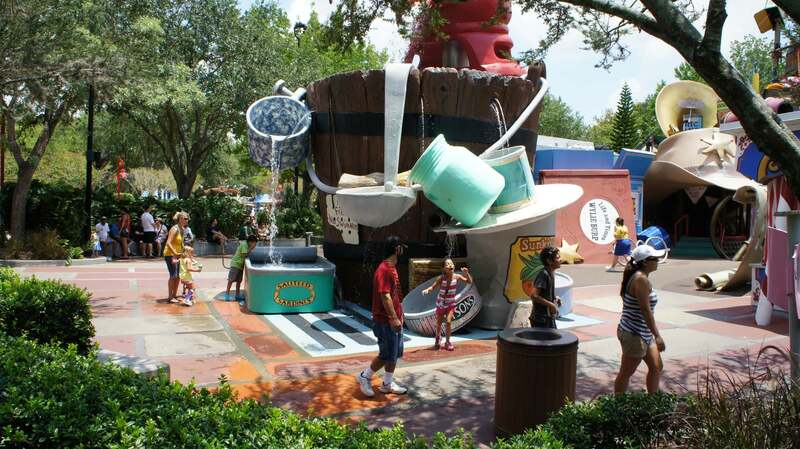 To learn more about planning the perfect family trip to Universal, check out Visiting Islands of Adventure with kids.